To rephrase a classic line, every happy family is happy in its own way. Singsing and Konstantin are already unique in that they are firmly bonded despite religious, national and linguistic differences. 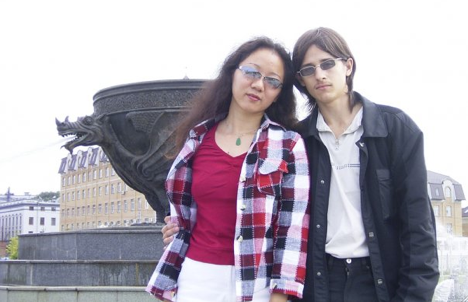 In this interview, Konstantin Kondratiev, an assistant in the Department of Philosophy at Kazan Federal University (KFU), and his wife Singsing Chen, an assistant in the Department of Philology and Culture of the Far East, explained how girls get married in China, where to meet one's future spouse, and the time span from first date to wedding, and even sang a Russian romance and a Chinese song. When I came to see you, I thought I'd be greeted by at least 30 people, a large wok in the kitchen, the sweet smell of Asian spices, and a Chinese melody. But I was met by the smell of native cabbage soup. K: (laughing) No, we don't have a wok here. Although generally a large frying pan is used in Chinese cuisine. S: But it's very hard to find a wok in the city. Such pans are normally only used in villages nowadays. What surprised you on your first day in Kazan? S: I was surprised by the little ‘gazelles.’ I didn't even realize at first that they were buses. I stood for ages at the bus stop waiting for a large people-carrier to pull up. Meanwhile, these toy cars kept scurrying past. Is that the only thing that surprised you? What about the Russian winter? K: It turns out that Singsing is more frost-proof than me. S: During the recent cold snap, I went swimming and didn't freeze. Singsing, of all the cities in our vast country why did you choose Kazan? S: I studied Russian language and literature at the People's University of China in Beijing. And we had a teacher from Kazan State University. She spoke about Kazan with such feeling that I fell in love with it then and there. And second, Moscow and St Petersburg already get too many foreign students. There are so many of them that they exist in their own communities. And as a result, they only communicate with each other and have no need to immerse themselves in the Russian language. They prefer to live in their own world. I arrived in Kazan in 2005, and my very first class on the Master's program was with Russian students. K: No one indulged her or anything like that. She was treated like everyone else. But she kept cool and got into the groove of speaking Russian. I'm curious to know where you met? K: We were introduced by a mutual acquaintance . He was having a get-together, and for some reason decided that I might like to meet Singsing. His cunning plan was to invite Singsing and me to the same party. We had a great evening, singing and chatting. Then, by chance, we met at university and talked for almost 2 hours. And I plucked up the courage and decided to ask Singsing out on a date. And after a month of dating, I confessed my love to her. You probably got married straight away if you were that sure? K: The wedding happened only 2 years later. S: I had to go to China for almost a year. And I even found a job in Shanghai. K: But clearly her feelings won the day, or else I was very persuasive. But we can say now that our love has stood the test of time and distance. And here you are back in Kazan. K: And I proposed to Singsing. S: Do you remember when it happened? S: How could you forget! It was Chinese New Year. K: Ah, that's right. I turned up with a ring, went down on one knee, and asked her to marry me. And Singsing agreed. Our wedding in Russia was more Chinese than anything else. It's not every day that you get to go to a Chinese wedding. Tell us what it was like. K: Our toastmaster met me downstairs and made a speech to the effect that the bride wanted to make sure that it was indeed her fiancé who had come. And for that she wanted a love letter in her native language. I'd been warned about this, and three days before had learned the three Chinese characters for “I love you” and drew them for her. And Singsing magnanimously accepted me. Were there many friends and family? K: Both here and in China we had a relatively small wedding: here about 30 people, in China just 15, only close relatives. S: I was born and grew up in Hangzhou, near Shanghai. K: The Chinese themselves say that if there is heaven on earth, it is in Hangzhou. S: Incidentally, Hangzhou and Kazan are twin cities. Let's dream a little about the patter of tiny feet. What names would you consider? S: If we have two, one name will be Russian, the other Chinese. K: And if just one? S: Then we'll have to decide. K: We might have to rack our brains a bit. S: Come to think of it, a person can have two names. As a rule, Chinese students in Russia give themselves a Russian name. K: Yes, and Russian students in China normally take a second name too. S: Natasha. They say it really suits me. K: It's very beautiful. Like you. I get the feeling you two are incapable of quarrelling. In the two years that you dated and the six that you've lived together, have you never wanted to smash a plate? K: Get outta here! You'd need the patience of a saint not to quarrel. S: The important thing is to argue without debasing yourself or your partner. Do you believe you were destined to meet? S: Let me be dialectical for a second. It's part fate, part hard work. It all took shape not because either of us is so wonderful. But because we made an effort to be together and to share this journey.